On Friday evening, a multisectoral meeting took place in Belgium, where the farming, meat and animal feed sectors asked for priority measures against the spread of African Swine Fever to be in place. In the joint statement coming from that meeting, they draw up five possible critical needs/measures to mitigate the disease spreading: a European plan to define and maintain the affected zone; the creation of a committee dedicated to the export of meat and pork products; a regulated slaughtering and butchering method for pigs in the area which is under tight surveillance; a realistic and feasible plan to reduce the boar population in the country; and finally the creation of a crisis communication committee. Arrangements are being done to ban the movement, hunting and feeding of wild boars in the region to control the spread of the disease by human interaction. An investigation and monitoring program is being implemented, with the support of European experts. With the reporting of two new outbreaks today (September 14th), unofficially, there have been 21 ASF outbreaks reported in China. 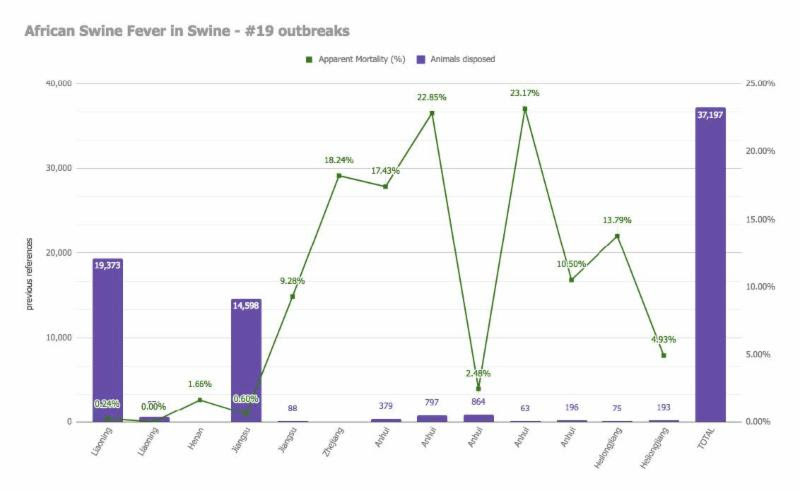 The last two reported outbreaks included (a) 16 hogs with sudden death in the Inner Mongolian Province, and (b) a farm in Henan Province, with 148 infected pigs and 43% fatality rate. Officially, however, the OIE WAHIS platform still reports only 19 outbreaks in six provinces (Figures 1 and 2). Although the cause of ASF introduction into China remains unclear, in March, 2018, FAO alerted for the risk of introduction of ASF into the country by illegal introduction of animals or food. There are also concerns that, similarly to what has been reported in Europe, wild boars may play a role in the spread of the disease. Approximately 40,500 pigs have been culled since the beginning of the epidemic, with mortality rates that varied between 0 and 23.17% (Figure 1). The Chinese government reported checking pigs in thousands of sites, which may have resulted in the increase of the identification of new outbreaks. In an attempt to contain the spread of the disease, all transport of live animals from infected provinces is restricted, feed policy is being adjusted to the current scenario, and the logistics of the industry and the Chinese market are being reviewed. On September 13th, the use of food waste and pig blood as feed for pigs in ASF-infected and neighboring provinces was banned. Also, testing pig feed to ASF will be required, and positive samples will trigger destruction of the whole batch of feed. China is considering to import meat from other markets, including the European Union, that in 2017 faced an intense decline in pork exports. US hog market is also currently facing a low price market, however with expansion in number of sows and pork produced. International trade is at risk once ASF is spreading rapidly into consolidated markets like Europe and China, and concerns are growing around the globe. Figure 1: Summary of outbreaks of African Swine Fever in China. Nineteen outbreaks were reported to OIE, in 6 provinces: Lianoning, Henan, Jiangsu, Zhejiang, Anhui, Heilongjiang (Source: OIE – WAHIS). Figure 2: Chinese provinces with reported ASF outbreaks (Lianoning, Henan, Jiangsu, Zhejiang, Anhui, Heilongjiang). The intensity of the green shade depicts the number of culled animals, with the Province of Liaoning (darkest green) showing the highest cull rate.